A diplexer is a device that separates or combines a high frequency and a low frequency. Each diplexer has a low pass cutoff frequency below which signals are routed from the common port to the low pass port, and a high pass cutoff frequency above which signals are routed from the common port to the highpass port. 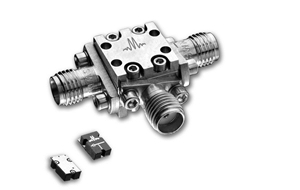 Excellent for use as a duplexer, absorptive filter, or frequency selective signal router, Marki Diplexers offer sharp corners in a small package. Custom designs are available across the band.